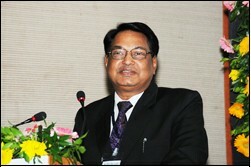 Mr RD Gupta – Business Head, Indorama Industries Ltd. The delegates at the second session on day-1 of the ‘International Conference on Manmade Fibre Textiles’ were enthralled by a scintillating presentation on ‘Spandex – Growth and Application’ from Mr RD Gupta – Business Head, Indorama Industries Ltd.
Bayer and DuPont together invented spandex and received a patent. DuPont later began industrial production and in the 1960s, Asahi Kasei and Toyo Boseki too developed production technology of spandex. The fabrics produced using spandex carry characteristics of comfort, wrinkle resistance (for woven), bounce and retain shape. Its applications are varied which include swimwear, outerwear/sportswear, lingerie, bottom weight fabrics (denim/suitings), top weight fabrics (shirting/blouse) and the shoe industry. In 2010, Asia accounted for nearly 84 percent of spandex output, with the American continent and Europe accounting for the rest. China with a capacity of 399,000 tons per annum accounted for nearly 70 percent of the global 575,000 tons per year spandex output. The North American market is the biggest consumer of spandex in the world with a share of 53 percent, followed by Latin America with 10 percent, with Europe, China and other countries making up for the rest of spandex consumption. Indian usage accounts for just 2 percent of global consumption. Mr Gupta said, “However, as a result of India clocking the second highest GDP growth rate and a robust growth in organized retail segment and branded clothing, Indian spandex usage is growing at 15 percent per year as compared to world’s expected growth of 7-8 percent per year”. He further informed, “Currently Indian direct consumption of bare spandex is around 6,000 tons per annum, all of which is imported, with 37 percent being consumed by the circular knitting sector, followed by air covered yarns with 27 percent, 19 percent from core spun yarns and the rest by narrow fabrics”. He added, “The spandex fibre may also find usage in the furnishing industry (Elastic webbing for sofas), load carrying (anti-shock webbing) and elastic braids for underwear, shoe industry, stationary and elasticized cords – round braids in the near future”.